Not complaining, but between holding down my normal school work & wedding planning at night, my days are fuuuuulllllll. The good kind of full that comes from throwing yourself into endeavors that take up time but bring you joy. I am after all a firm believer of "you get out what you put in". That being said, with limited time to play around in my closet, my clothing choices have been gravitating towards those magical pieces in my wardrobe that everyone thinks look sooo put together, but only I know they feel as comfortable as wearing my pajamas. A linen sweater that is sweatshirt soft & classic white denim that is like wearing my worn in leggings. What are your secret pajama pieces in your closet? What a cute outfit!!! Those jeans are perfection! 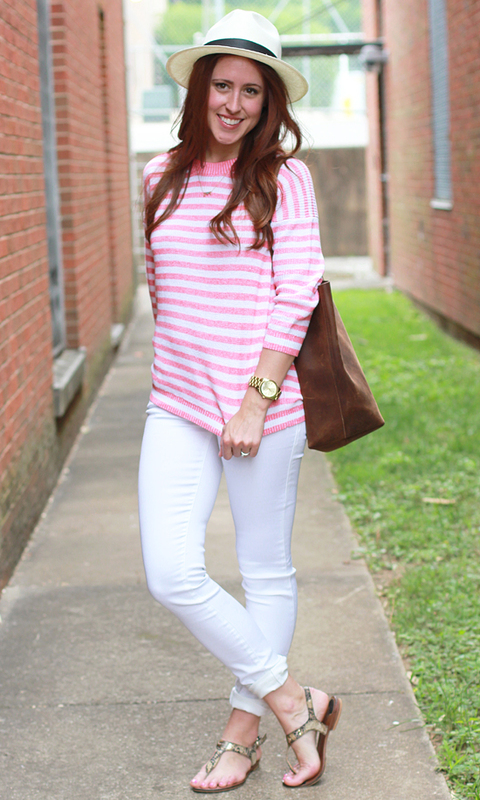 I love hats, stripes, and bright white, so this outfit hits the trifecta. Aaaaand, I pretty much choose all of my outfits based on the pajama factor. All of my maxi skirts qualify every time. I don't have to sit like a lady for fear of showing off my parts, and I could easily curl up to take a nap. Win-win. I love this look , pink and white is always cute , i'd say my leggings I have quite a variety that I turn to when I want to me super comfy. I love this sweater! And I am mad at you. Because I tried on the same sweater the other day and it did not look like that on me. Something about the shoulders was really weird. But I probably just have weird shoulders. In my head it was supposed to look just like it does on you here. Those jeans look amazing on you! Love the back shot too, so cute! love outfits that feel like pajamas! that top is so cute! I love "jeggings"- skinny denim jeans that fit like leggings. It's pretty much all I wear! I just bought my first pair of white jeans last week! So, I'm glad to get more inspiration. I have an outfit I call my daytime pajamas. My jeggings and a jersey. gorgeous items here. love the sweater and the jeans are absolutely fab. :) your life sounds busy but happy! I have "pajama outfits" too! They're so comfy, but amazingly they still look put together (which I love!). Your hair is so pretty here! love the skinnies, this outfit is sooo cute~! xO! This looks so cute and comfortable! I think the hat makes it look really put together. 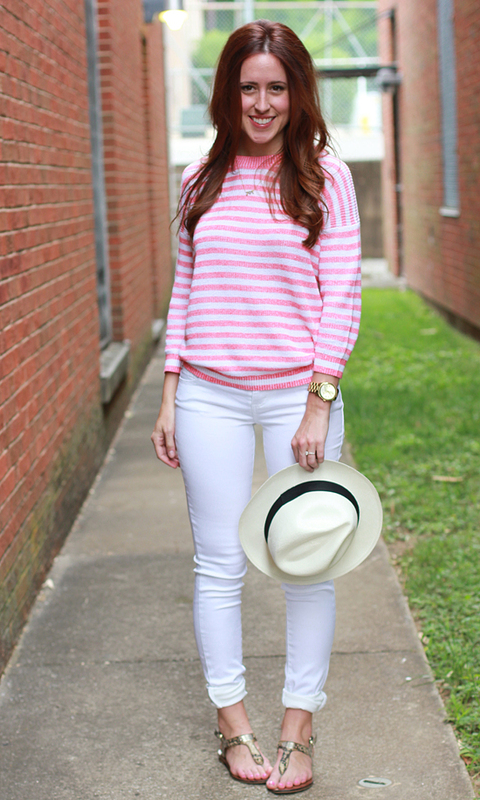 Love the sweater and the panama hat (that I still need to add to my closet). And please don't take this the wrong way, but can we talk about your A$$ for a second?! DANG GIRL!!! Whatever you are doing is working because your behind looks amazing in those jeans!! i love this outfit - pink and white together are so pretty! the hat makes it even cuter! my pajama outfit would be any soft shift dress i have...super easy to throw on and accessorize but still comfy! You look gorgeous...LOVE those CP jeans on you!! I am loving those jeans on you! Adorable light weight sweater and in love with the hat! Love this outfit. Looks super put together and cute. Especially love this sweater! You're so cute Jessica! I love your comfy but cute outfit and I'm obsessed with your new panama hat. I always choose my outfits based on comfort so (sadly or awesomely... you decide lol) all of my pieces are secret pajamas! Love this outfit! It's perfect for summer and not to mention super cute! Love your striped sweater and hat - you look so cute! Those white jeans look fantastic on you and that sweater appears to be the perfect mix of chic and comfort. I am a big believer that comfort doesn't have to be sacrificed for style. I love that sweater! I kept eyeing it at J.Crew but not sure why I never go it. It looks great with the white jeans. And your hair is amazing!!! Cute look- casual but put together. In the summer maxi dresses are my quick "go to" item. Throw on a blazer or a cardigan and it's a perfect look for work. Honestly I feel like my legs look like sausages in 99% of skinny jeans - it is all about finding fabric that is thick enough to conceal skin rolls but thin enough to not add bulk... tricky tricky! I love the outfit. Might wear something similar myself.